I eat a lot of salads throughout the year, even in the winter. I love all salad ingredients – lettuces, avocados, beets, raw vegetables, grilled meat or fish, some nuts or seeds and cheese… I love to mix them up and also pay great attention to my vinaigrettes. But then, there’s this one salad I’ve actually made multiple times for friends. (My husband doesn’t eat salads.) I don’t remember the source of the recipe, because mine was a magazine recipe cut and glued to an index card from decades ago. It’s a composed salad, and these are the ingredients: Barley, purple cabbage, carrots, celery, dried cherries, and feta cheese. Intrigued? I was, and now I’m hooked. It’s very pretty served layered in a trifle dish, or any deep clear bowl. Each component is treated separately for maximum flavor. The recipe is really in two parts. One part, the vinaigrette. The other part, the salad itself. First prepare the vinaigrette. Set aside at room temperature. Cook the barley in 4 cups of water or broth if you prefer. Let cool. Once it’s almost room temperature, mix the barley with about 3 tablespoons of the vinaigrette and set aside. Place the grated carrots in a small bowl and add about 2 tablespoons of vinaigrette, stir well, and set aside. Place the cabbage in a large bowl and toss with about 2 tablespoons of vinaigrette. Have the rest of the ingredients handy. Place the sliced celery in a smaller bowl and add a tablespoon of vinaigrette. Toss well and set aside. Layer half of the barley in the bottom of your salad serving bowl or dish. Cover with the celery. Then add half of the cherries. And top with half of the goat cheese. Then cover with 1/2 of the cabbage. Then all of the carrots. Top off with the last of the dried cherries and goat cheese. Let the salad sit for at least an hour. Or, make it the day before and refrigerate it overnight, letting all of the flavors meld together. But serve at room temperature. I also serve this salad with extra vinaigrette for those who want that extra hit of vinegar. And, if this salad is for those who require protein, it is fabulous with added grilled chicken or avocado. Mix and match your favorite ingredients – lentils would work instead of barley, for example – and I’m not a huge celery fan, which is why I only allowed one layer of it. But do include the dried cherries and goat cheese! The cookbook by Martha Stewart, called Martha Stewart’s Hors D’Oeuvres Handbook, was published in 1999, pretty soon after I started my catering business. It’s a beautiful book, even if you’re not a Martha Stewart fan. Her ideas for hors d’oeuvres are, not surprisingly, creative and unique. Sometimes they’re on the crazy end of the spectrum – completely impractical and unreasonable. One thing always got my attention – savory biscotti. She served them like fun crackers, but they could be used for canapés. When I think of biscotti, I always think sweet, like my Christmas biscotti. But these are savory varieties, and include ingredients like nuts, seeds, cheese, olives, and other goodies. I imagined them to be really good served alongside cheese, with prosecco or rosé. I decided it was time to make a variety of savory biscotti for a fun get-together, to have something unique on hand! The following recipe is the base recipe. What I actually used in my savory biscotti is below. Place the flour, pepper, baking powder, and salt in the bowl of an electric mixer fitted with a paddle attachment. Combine on low speed. Add the butter and beat until the mixture resembles coarse meal. 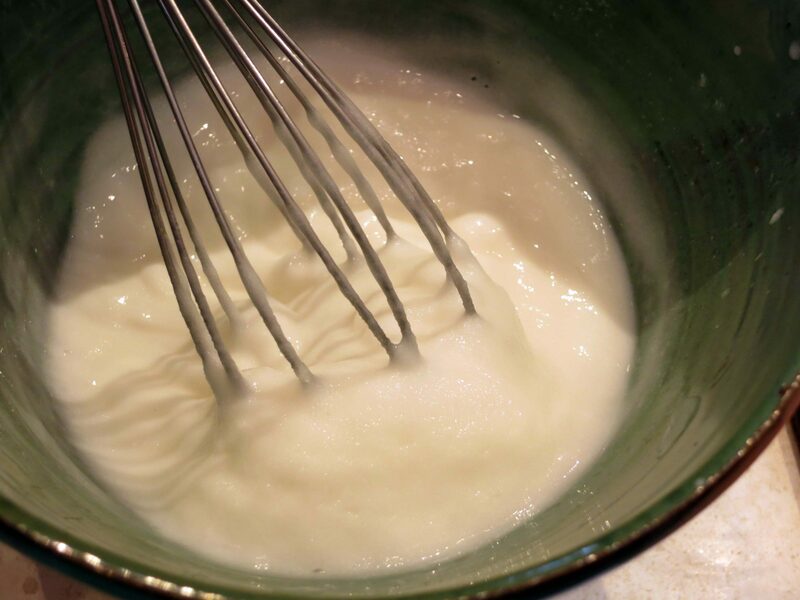 In a small bowl, whisk together the 2 tablespoons of olive oil, the eggs, and milk. Gradually pour the milk mixture into the dough and mix just until combined. This is the base dough for savory biscotti. Before chilling the dough and proceeding with baking, add various combinations of savory items and make sure they’re well distributed. I kneaded the dough a bit before folding in my add-ins, which are listed below, along with Martha’s suggestions. Preheat the oven to 350 degrees F. Grease a baking sheet with the remaining olive oil and set aside. Transfer the logs to the prepared baking sheet, cover with plastic wrap, and refrigerate until chilled, about 30 minutes. Brush each log with an egg wash (1 large egg beaten with 1 tablespoon water and a pinch of salt). I didn’t do this. I did make sure there was a bit of grated cheese on the top of the biscotti, however. Bake until the logs are light brown and feel firm to the touch, about 30-40 minutes. Reduce the oven to 250 degrees F.
Using a serrated knife, slice the logs crosswise on a long diagonal into 1/4″ thick slices that are 3-4″ long. Arrange the slices cut-side down on a wire rack set over a baking sheet and bake, turning the biscotti halfway through cooking time for even browning, until crisp, about 40 minutes. Cool completely and store in an airtight container at room temperature for up to 1 week. These biscotti really are fabulous, and perfect on a cheese platter. Charcuterie would be a fabulous addition. Today I simply paired them with Cambazola, but they’d be crazy good with a soft goat cheese or any spreadable herbed cheese. You can really go crazy with all of the ingredient choices. Martha Stewart’s orange zest suggestion was really tempting but I didn’t have any oranges on this day. Instead of all olive oil, you could use a flavored or infused oil, or even a little truffle oil. I’ll definitely be making these again, and will enjoy switching up the ingredients. In a small bowl, whisk together the 2 tablespoons of olive oil, the eggs, and milk. Gradually pour the milk mixture into the dough and mix just until combined. Divide the dough into 4 equal parts. Brush each log with an egg wash (1 large egg beaten with 1 tablespoon water and a pinch of salt). I truly love condiments, especially those seasonally-based, like chutneys. And, because I love to “play” in the kitchen and use whatever ingredients I have on hand or am in the mood to use, I wanted to show how easy it is to make your own chutney sans recipe. It’s about creating a chutney that you love, customizing the ingredients to your tastes, according to the seasons. Indulge. Chutneys are fabulous. I have an actual recipe following this “primer” of chutney making below, but seriously once you make a chutney, you’ll see how creative you can be and how well they turn out. A recipe is not necessary. A chutney is about combining fruits – the sweet factor, and aromatics – the savory factor, and then adding seasoning and flavorings. The sweet-savory ratio is important, however. I use about 2/3 fruit to 1/3 aromatics in my chutneys. You don’t want it all fruit, or it would be a jam. I season the chutney according to my tastes and the time of year. There are spicy fall and winter chutneys, and there are light, vibrant chutneys you can make for spring and summer appearances as well. (Like my Strawberry Onion Chutney.) It’s all about seasonal ingredients. You can use fresh fruit: apple, pear, mango, apricot, plum, cranberries, strawberries, peach, etc. And you can use dried fruit: cranberries, cherries, figs, apricots, raisins, dates, blueberries, etc. A combination of fresh and dried makes a nice consistency, like pear-dried fig, peach-raisin, apple-dried apricot. Using three fruits works really well, like apple-mango-dried cherry. Or cranberry-apple-date. You get the idea. If you’re using dried fruits like raisins or cherries, you can soak them in port or fruit juice first to soften them and soak up the flavors, then use it all in the chutney-making process. I always use a combination of fresh onion, garlic, and sometimes shallots and fresh ginger. You definitely need onion; the rest is optional. There is always a sweet component in chutney to balance the aromatics. If you’re using tart cranberries, you would definitely need more sugar than if you were using, say, ripe peaches or strawberries. You can use brown sugar, white sugar, turbinado sugar and so forth. Liquid forms of sugar don’t work well in chutney, because they’re too, well, liquid. A prepared chutney is soft, but not a pile of syrupy mush. But you can add a teaspoon of maple syrup or boiled cider. Except for salt, you don’t have to season a chutney at all, although I happen to love black pepper, white pepper, and cayenne. For fall and winter chutneys, I like them full of flavor – especially when they’re going to be served alongside fairly bland meats. The choices are vast, depending what you want your chutney to taste like. I, personally, love that what curry powder adds to a chutney. But separately, you can use cumin, cardamom, coriander, etc. A cinnamon stick adds flavor while the chutney is cooking, but ground cinnamon can be used as well. And nutmeg, cloves, and allspice are always yummy. Think of them in an apple-pear-dried fig chutney served with a pork loin. YUM. Another fun ingredients are small pieces of crystallized ginger. You can also add ground chile pepper, like ancho or even chipotle powders, to a chutney. And also adobo or adobo powder – especially if you’re making the chutney for a Southwestern-inspired meal. Any vinegar will work in a chutney. I love cider vinegar and red wine vinegar, but a white balsamic vinegar works well also. Nothing fancy is required. Add the oil to a hot stock pot and let it heat over medium. Add the onions and sauté for about 5 minutes, without allowing browning. Give the garlic a stir into the onions, then add the cranberries, apple, and raisins. Stir together. Allow to heat up, then add the sugar, cinnamon, curry powder, salt, and the cinnamon stick. Stir well, then cover the pot, turn down the heat to a simmer, and let cook for at least 15 minutes. It will look like this. Add a couple teaspoons of vinegar and stir in gently. Unless there’s excess liquid, remove the pot from the heat. Let the chutney cool, remove the cinnamon stick, then store in sterilized jars. Not only does this chutney go beautifully with Thanksgiving turkey, but also with chicken and pork. Here I’ve served it with roasted pork and sweet potatoes. As you can see, there’s a lot of leeway when creating a chutney. They can be simple or complicated from an ingredient standpoint, but they are very easy to prepare. Chutney is also wonderful topping a baked Brie, and can be used in individual Brie and chutney bites. Just remember to cook off any extra liquid over extremely low heat, and also don’t overstir. You want to see the beautiful pieces of fruit in your beautiful chutney! Years ago I was visiting with my favorite florist Dan, who is quite a foodie, and he asked me if I’d ever had cranberry salsa. Cranberry salsa? I’ve never heard of such a thing! Where have I been? This just made me absolutely giddy. It’s always so exciting to come across something new and different. Dan printed the recipe, and gave me a few suggestions on adaptations he’d made to it. But he promised me I’d absolutely love it with the turkey I’d be serving on Thanksgiving. And I did. Here is that recipe. Thanks, Dan! Place the cranberries in a colander. Remove any bad ones and give the rest a good rinse. Then place the cranberries on a towel to dry. Place the jalapenos, garlic and sugar in the food processor and pulse until you can’t see any large pieces. Add the cranberries, cilantro, oil and lime juice and pulse all of the ingredients, without over-processing. Pour the salsa into a bowl and fold in the sliced green onions. I’ve found that this is easier than using the food processor to chop up green onion. Cranberry salsa is really good, and I serve it with tortilla chips or pita crisps. You can refrigerate the salsa overnight, but serve it at room temperature. And as a condiment, it’s spectacular with turkey. I make turkey cutlets often, and the pairing is fabulous. Whether served as an appetizer or as a condiment, you’ll enjoy the zing of the cranberries and jalapeño. The original recipe called for 2 cups of sugar, but I can’t fathom adding more than the 1 cup of sugar I used. It’s perfect to me just the way it is. Next time I might consider adding some toasted walnuts or pecans to the salsa at the last minute. 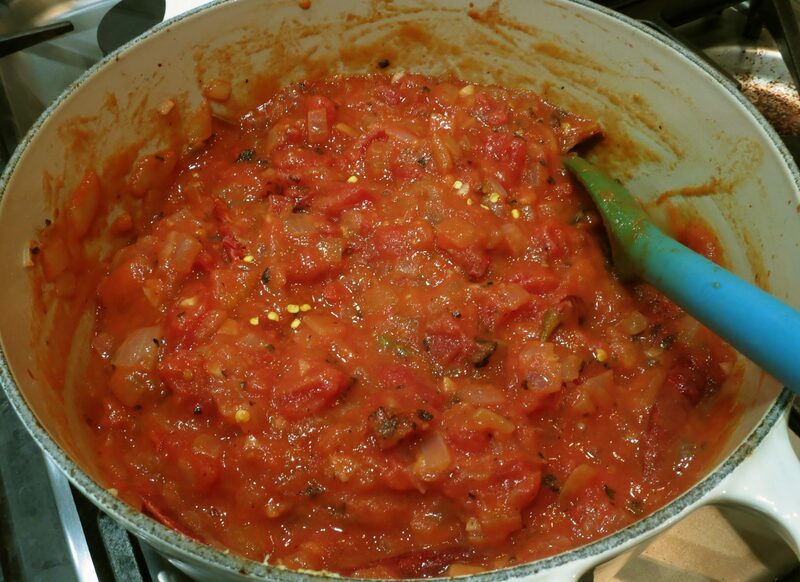 We’ve all made a red sauce or marinara, sometimes even referred to as spaghetti sauce. But to me there is another, equally important red sauce in my life, and today I’m sharing it with you. It’s not for pasta, but instead, it is a sauce for meats – grilled meat, barbecued meat, smoked meat, and so forth. It’s tomato based, but it’s spiced up with mustard powder and dried chile peppers. Intrigued? You should be. But be aware, it’s not for the faint of heart, or tastebuds. This recipe is based on the one I originally followed in the Foods of the World Series, more specifically, American Cooking: The Great West. I originally made a major change by omitting sugar. This sauce has no business being sweet! Hope you like it as much as we do! Heat the oil in a medium-sized pot over medium-high heat. Add the onions and sauté them for about 5 minutes. Then add the garlic, and stir them around until you smell garlic oil; you don’t want to burn the garlic. Pour in the diced tomatoes and purée, then add the ground mustard and crushed chile peppers. If you want, start with just a few whole peppers, perhaps, and cook the sauce until no liquid remains; it should be nice and thick. It will only take about 30 minutes for the sauce to finish. Remove as many of the pods as you can. Taste it for seasoning; I added 1/2 teaspoon of salt. If you prefer heat, let the sauce sit overnight with the chile pods; remove them before heating and serving. The sauce is spectacular with smoked turkey, pork ribs, grilled flank steak, even shrimp. If you like to cook and garden like I do, then you probably grow a variety of chile peppers. It doesn’t take but a couple of pepper plants to keep a family stocked with fresh chiles, but I always plant too many. This is especially true with jalapeños, cause we like them. So here’s an idea that might come in handy when you have jalapeños coming out your ears like I do. Dehydrate them! Place the slices on dehydrator trays, making sure they’re not overlapping. I place the heat setting on 118 degrees Farenheit. It typically takes about 24-36 hours, depending on the fleshiness of the chile peppers and the thickness of the slices. And take note – even though the jalapeños are dehydrated, they’re still very strong! 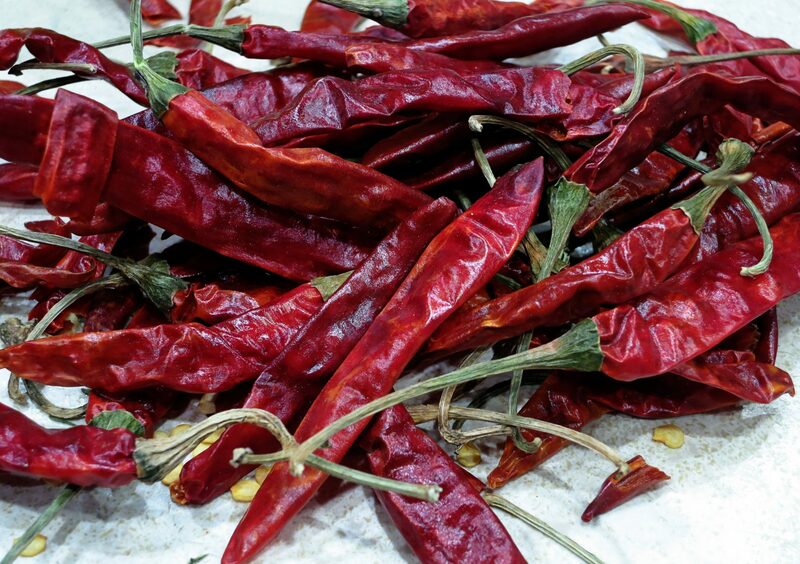 And during the dehydration process, the air in your house will be chile pepper-potent. After they’re completely dehydrated, let them cool completely, and store in sealable bags in the refrigerator. You can tell that I used green and red jalapeños in the batch I just dehydrated. Alternatively, if you don’t own a dehydrator, place the slices on a jelly-roll pan, without overcrowding, and put the pan in the oven at about 200 degrees. It should only take about 8 hours. Lower the heat towards the end – you don’t want any browning, just dehydration. Either way you dehydrate them, they’re handy for soups and stews, chilis, beans, stuffed bell peppers, omelets, or this stir fry. Here they are topping a summer zucchini and corn soup. Here they are on a chicken curry. I hope you find dehydrated chile peppers as handy and versatile as I do! Having a dehydrator is also helpful if you have an abundance of cherry tomatoes! Now, if you have a lot of jalapeños you can do what Debbie and David do from The Mountain Kitchen, which is to make their own chipotle peppers! If you weren’t aware, chipotles are smoked and dried jalapeños. Enjoy their beautiful photo! This post was originally published in 2015. I don’t think the photos are terrible, which is typically why I’ll repost a recipe. I’m reposting this because it’s something I’ve not seen of any other blog in the 6 years I’ve been blogging. So here you go – a uniquely fabulous ice cream. You’re welcome! When it comes to home cooking, I rarely make the same thing twice, let alone multiple times. It’s just how I roll, thus my motto, “so much food, so little time!” There’s just too much out there to try! But this ice cream is one major exception. I’ve been making it for years. My kids always got mad that I wasn’t making chocolate ice cream when they were little, but instead one lime-flavored. However, they loved it, too! Here’s the recipe I cut out of a magazine so many years ago. One doesn’t expect lime ice cream, perhaps a sorbet instead. So it’s unique in that sense. Hope you like it as much as we do! Pour the cream and water into a large blender jar. Add the zest and lime juice. Add the sugar and salt, and give it a good blend. Place the blender jar in the refrigerator and leave it there overnight. You really want to get the limey flavor dispersed into the cream. When it’s time to make the ice cream, follow the directions for your machine. Freeze the container until ready to serve. I love to serve this ice cream with piroline cookies. If you love lime, you will adore this ice cream! It’s limey, but it’s also creamy. Fabulous! This ice cream is perfect after a Mexican meal, or a traditional summer barbecue. And just in case you’re still thinking this is not a creamy ice cream, take a look at this! This recipe originally posted in April of 2013. Because this Italian cocktail is so delicious and unique, I decided to re-publish the post. 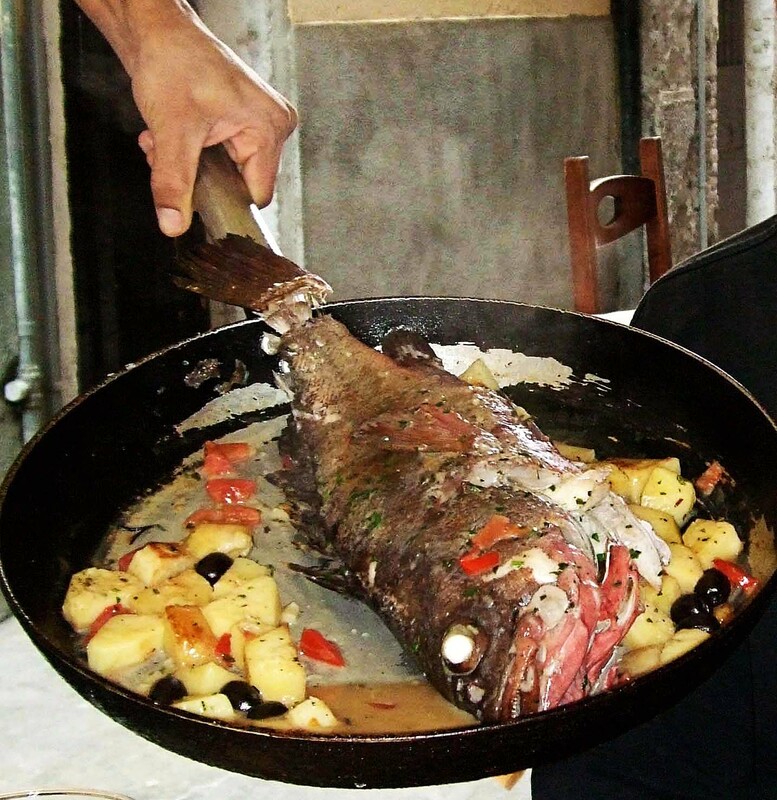 We chose a whole sea bass for lunch, which was spectacular, as you can see. After dinner, the waiter turned to me and suggested a drink to help with digestion. Perhaps I looked like I’d eaten the whole fish by myself? 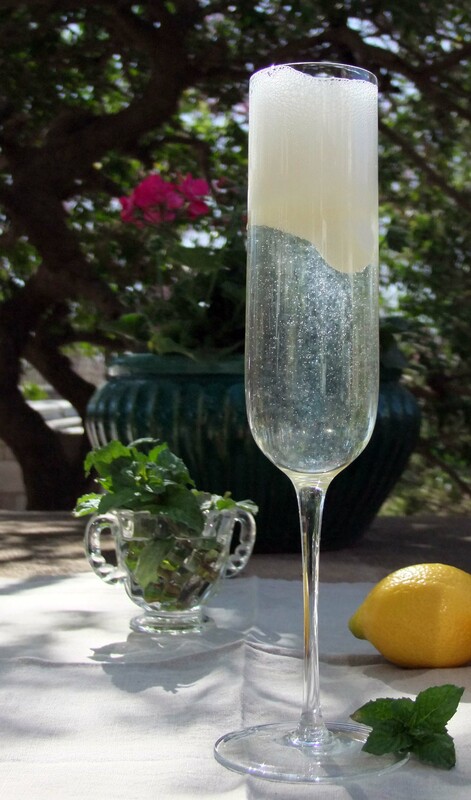 But since he described an alcoholic-based drink and mentioned limone, I was all for it. It ended up being like a limoncello with cream. But even better. Now, I truly, my dear blogger friends, was not intoxicated, as it looks. I was definitely enjoying my Sgroppino, but was caught mid-blink by my husband behind the camera. It’s because of this drink alone that I kept the photo, but it’s also a great reminder of the unexpectedly wonderful time we had in Venice. When I got home, you can bet I looked for this drink online. 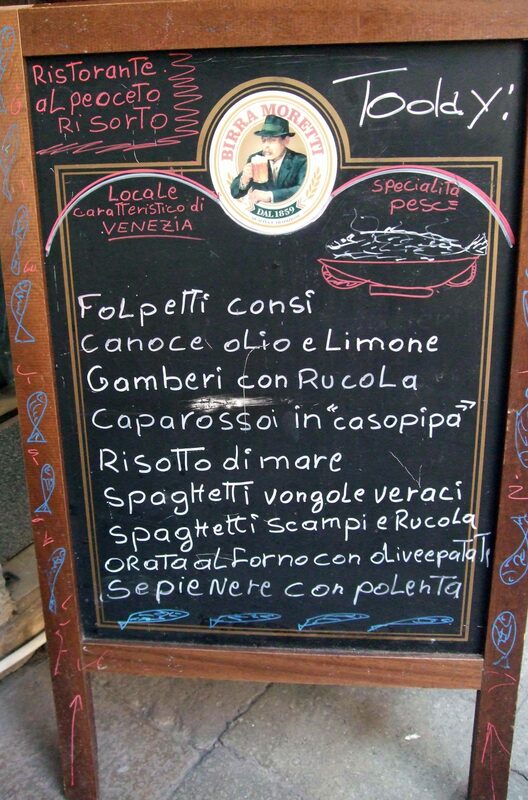 It’s called sgroppino – SRO-PEE-NO, with the accent on the PEE. There are actually two versions of Sgroppino, according to what I read. 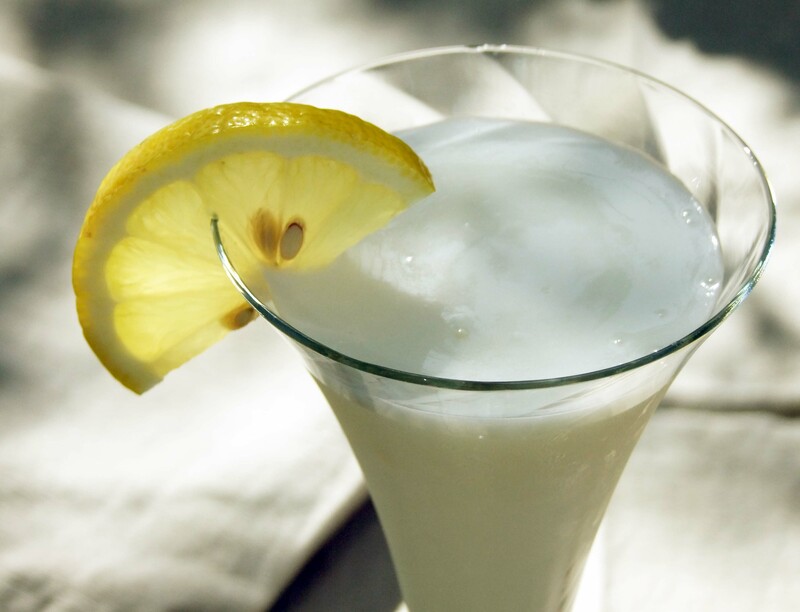 One drink is definitely what I enjoyed in Venice – a creamy, bubbly lemon drink. The other drink doesn’t contain cream. 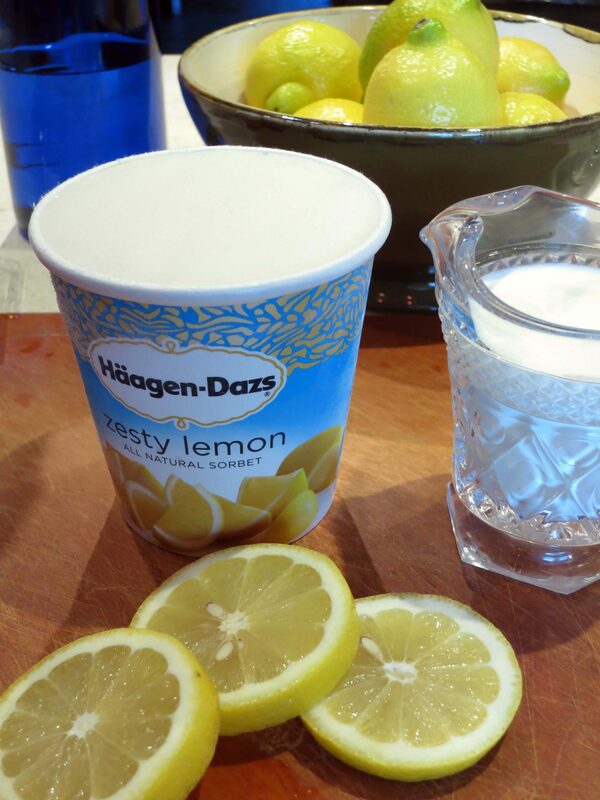 Whisk the lemon sorbet in a medium bowl until it is smooth. 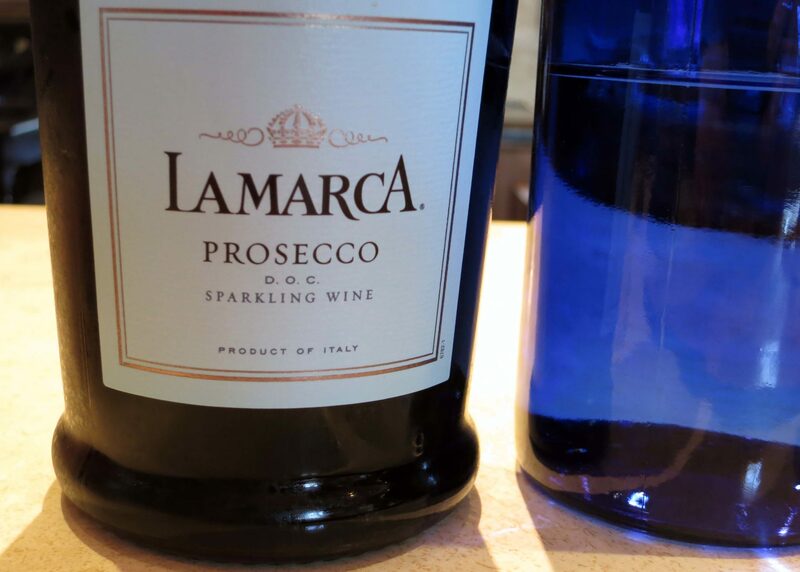 Gradually whisk in vodka, cream, and prosecco. Alternatively, you can use a blender. 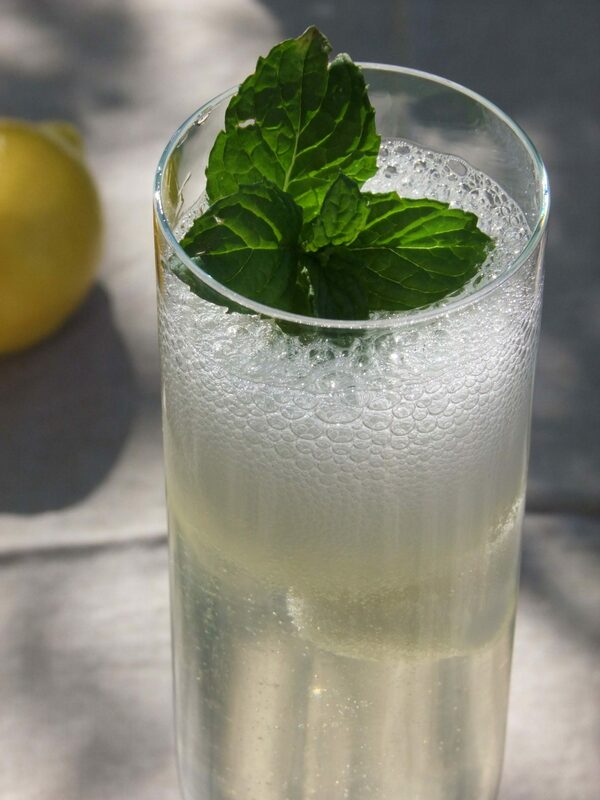 Pour mixture into chilled champagne flutes and serve immediately. 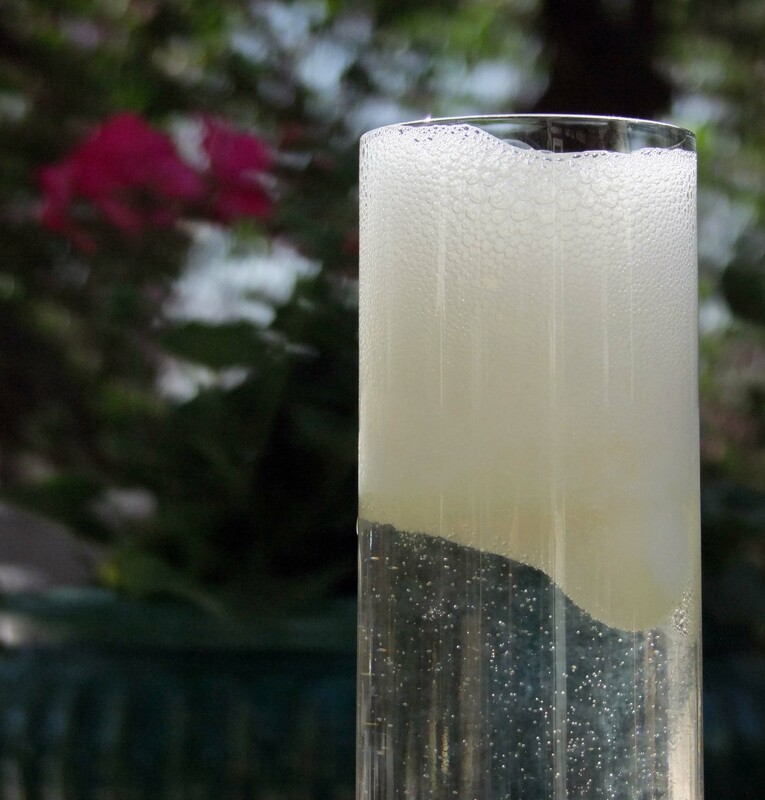 Mix the Prosecco and vodka together, then divide in between 4 chilled champagne flutes. Spoon a scoop of sorbet into each flute, and decorate with a mint sprig. Serve immediately. 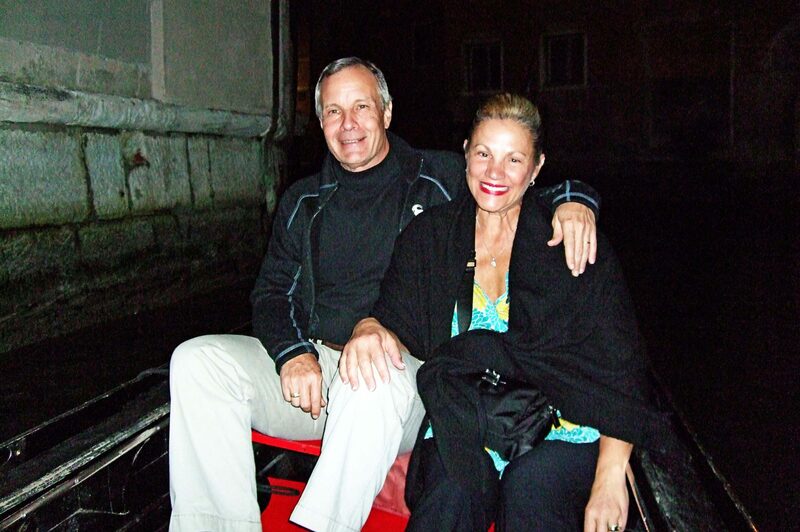 My husband and I tend to stay away from tourist attractions, and prefer experiencing Europe as non-tourists, but if you’re ever in Venice, ride the darn gondola. It truly is magical. I don’t know if they all do this, but our gondolier sang!!! And it was lovely. There an adorable young Italian woman whose blog I follow. Her name is Alida, she was born in Friuli in North Eastern Italy, and her blog is My Little Italian Kitchen. I follow her on Facebook as well, because her daily food photos make me happy. Like these. So colorful and enticing! Although now living in London, Alida travels often throughout Italy, visiting artisanal bakers and cheese makers, and has also won cooking competitions. Let’s just say she knows what she’s doing, and is passionate about Italian food. In the spring of 2017, Alida posted a recipe for Asparagus Ham Lasagna that I couldn’t ignore. “Traditional” lasagna is so wonderful, but I love other varieties as well, even meatless varieties. It’s my idea of comfort food. Fresh pasta sheets, bechamel, a purée of asparagus, ham, asparagus pieces, and Parmesan, all layered and baked to perfect deliciousness! I can’t believe I’ve waited a year to make it. Plus, it was an excuse to finally use my Kitchen Aid pasta rolling attachment. The pasta dough I started with included 3 eggs plus 2 yolks, and 1 tablespoon of olive oil. Whisk the eggs and olive oil together and gradually add flour until a dough forms. Turn out onto a slightly floured board, knead a minute, then wrap up in plastic wrap and let sit at least 30 minutes to rest. Roll out the lasagna sheets to the desired thickness. They can be a little thicker than sheets you would use for making ravioli. I used #6 on my attachment. Cut to 13″ lengths and set aside. Clean and peel the asparagus if they are large. Remove the thicker ends and cut the tips off. Cut the asparagus in small pieces and cook them in salty water. I cooked the tips first just to keep it simple. Whiz the stems into a purée and set aside. Make the bechamel and set aside; I’ve included a link to my own in case you’ve never made it before. Have the grated Parmesan and ham handy. Preheat the oven to 375 degrees F. Lightly grease a 13″ x 9″ baking dish. When you’re ready to prepare the lasagna, add some bechamel to the bottom of the baking dish and cover with a few lasagna sheets. Add some asparagus purée, ham, cheese, and more sauce. Cover again with lasagna sheets. Continue layering. On the top, make sure there is bechamel, ham, cheese, and the remaining asparagus. Bake, covered, for 35 minutes, then remove the foil and bake another 20 minutes. Let the lasagna sit for about 30 minutes before cutting up the servings. The lasagna actually sliced very well while it was still warm. You can see the lovely layers on white sauce, ham, asparagus puree, and asparagus tips. I sliced the asparagus tips lengthwise after they had cooked and cooled, because I felt they were quite thick. I love traditional lasagna, but this is definitely second best! And in spite of the bechamel, this lasagna doesn’t seem as heavy as traditional, probably because the only meat is thinly shaved ham. I’ll definitely be making this again! In 2014, my daughter and I visited Stéphane Gabart of the My French Heaven blog. I’ve sung his praises many times before on this blog as the result of now three visits to him in his French heaven. His expertise, of course, are food and wine, but because visits are customized to your interests, he also can take you to castles, fortresses, and places like Abbey de la Sauve Majeure. Stéphane sent me a photo of me holding the bag with my new cookbook and, of course, also fiddling with my camera. And I had to throw a pic in of my gorgeous daughter, walking with me in the French countryside. The cookbook is beautiful, with creative artwork, interesting stories and anecdotes. I decided to make a lentil soup recipe from the cookbook because it contains two interesting ingredients – crème fraiche and hazelnut oil. And, the soup is puréed. Why in the world would I think that a cookbook purchased in France would be in English? Silly American. Thanks, Mom, for the translation help. Peel, rinse, and chop the carrots, shallots, celery, and the garlic into small pieces. Let them cook softly in a little butter in a large pot over low heat. Add the lentils and add three times the volume of water. Let the lentils cook for about 20-25 minutes. Stir, then add the crème fraiche and butter. Emulsify the soup with a hand blender, and incorporate the hazelnut oil. Pour the soup into warmed serving bowls, and top with the cooked bacon. It kind of bothered me to purée the lentils. I love the taste of le Puy lentils, but I love them also because they hold their shape, which is why they are not only good for soups, but even side dishes. I should have put the lentil soup in a blender, but decided the texture was fine semi-puréed. The texture obviously had no affect on the flavor, which is what I was most interested in. Unfortunately, the hazelnut flavor was too mild, and I wasn’t willing to add more oil. But what I did love was the creaminess of the soup. Next time I’ll definitely include a bit more butter and crème fraiche, but not bother with the hazelnut oil, except for maybe a drizzle on top. Cook the lentils for 20-25 minutes, or until tender. Proudly powered by WordPress Theme: A Simpler Time.